Cross-border online consumer purchasing is increasing 28% a year and will reach $1 trillion by 2020 according to information published by Internet Retailer. That’s nearly twice the growth rate for consumer web purchasing as a whole, which is expected to reach $3.4 trillion within the same time frame. That’s great news for eCommerce companies – especially those that have figured out the ins-and-outs of international fulfillment and shipping. If you’re just starting to focus on international sales, however, you may want to speed up the process by tapping into the expertise of a competent 3PL fulfillment partner. Once you outsource some of these functions, you will have more time to focus on core requirements and enhance competencies. New markets and customers - The age old concept of only large companies entering international markets is no longer true. With advancements in technology and the ability to access any part of the world online, enterprises of any form and capacity are able to reach out internationally. With the facility of online fulfillment and logistics, outsourcing offshore shipping and warehousing task is as easy as shipping in your own state. Hassle-free shipments across the globe - Managing international shipping is not an easy task. Shipment tracking, on-time delivery, damaged items, loss of products, brokerage charges and so on are a few factors that one would need to keep in mind when dealing with shipping globally. By working with a qualified fulfillment partner, the burden of storage, warehousing, shipping, tracking, delivery and follow up no longer rests solely on your shoulders. Enhanced customer satisfaction - At the end of the day, the success of your business depends on customer satisfaction. Satisfied customers become repeat buyers and positive feedback from them often leads to referrals and, ultimately, new customers. Outsourcing shipping and warehousing allows you to establish service level standards that exceed what can be accomplished in-house and thus deliver higher degrees of customer satisfaction. Cost containment - Expanding internationally is often not feasible. Acquiring warehouses, setting up new infrastructure, refitting and re-staffing will all require considerable investments. When you outsource, you utilize the existing resources including space, technology and employees of your partner company. Consequently, at reasonable cost, you will be able to focus on your business growth while still catering to customers globally. 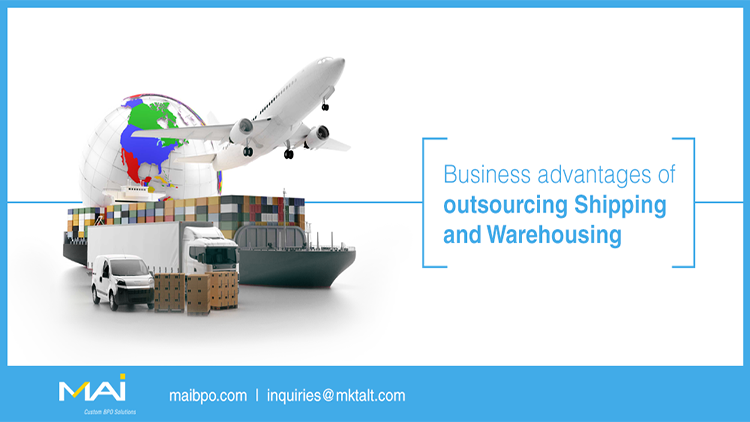 Thus, outsourcing shipping and warehousing would extend the visibility of your products globally.